Those of you who know me know that I love taking photos of doors and windows, especially if they are festooned with lace or flowers or vines. That’s the first thing I want to see whenever we go ashore. I’ve seen a good deal of lace curtains blowing in open windows over the past week. We had to get out of St. Barths earlier than we would have liked due to strong westerly winds that made the harbor quite unpleasant. Before we left a number of boats had already dragged anchor, and two in particular had tangled their anchors and lines with other boats. This took place in the very dark hours after midnight when these types of calamities always choose to happen. Murhpy’s Law on boats, don’t know you. 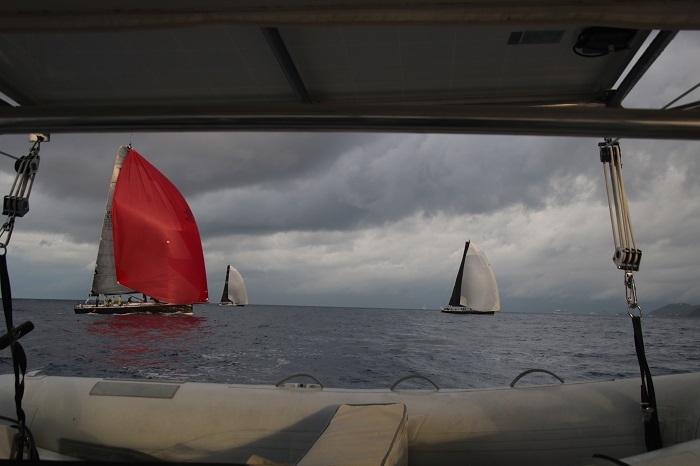 The pre-dawn departure to sail to Antigua that day was no fun, although I’m certain that Bob enjoyed it, especially the part when several of the Caribbean 600 contenders crossed our path–flying spinnakers no less. At one point during the journey, when I was fighting a moderate case of mal de mer, I could hear all the cans and jars in our pantry crashing back and forth, and the pots in pans in the cabinets doing the same. Can you imagine taking your house out in to the elements and letting your possessions get bashed around for a few hours every few days? That’s one of the main reasons that sailing is an endless game of ‘whack a mole.’ Everything keeps getting bashed about until it breaks. 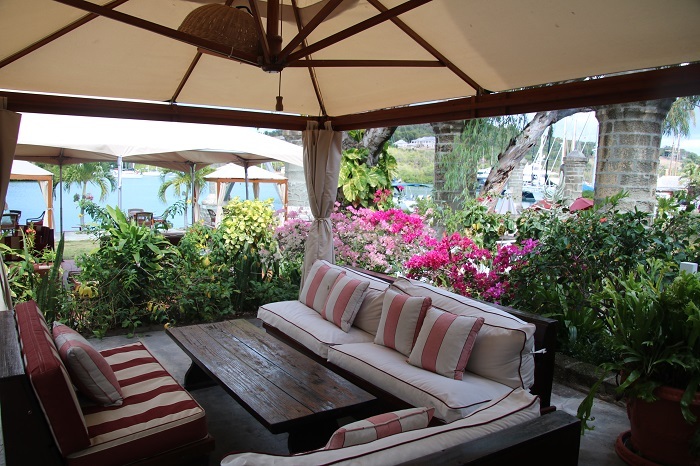 Anyway, we are safe and sound in Antigua now, and here are some scenes from English Harbor. Lord Nelson was here for a number of years, and these buildings were here then as well. There is a small but well curated museum dedicated to Lord Nelson, that we enjoyed–no photos this time. We had lunch in this historic building that is now a hotel and restaurant, and were underwhelmed by our meal after a couple of weeks of food in the French islands. However, I think that English food is unfairly maligned–we just had a bout of bad luck. I’m sure we’ll have other great meals ashore here….we just didn’t pick the best place yesterday–charming spot though! English Harbor is charming, isn’t it?–although life here in the 18th century certainly had a dark side. 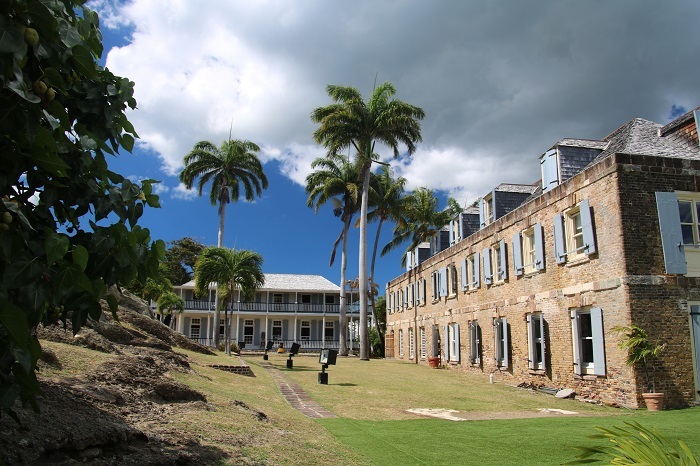 On one of the placards at the Nelson Museum I read that 40,000 English soldiers died on this island (over how many years?–the placard didn’t say) from minor things like heat stroke and similar maladies, often brought on from wearing layers of wool clothing in a tropical climate. I couldn’t help think about the women and their corsets and their own layers of undergarments. This is part of the customs and immigration offices, where we checked in. The quaint building on the left is still in use as sail loft. I don’t know how long it has been in use because there is an even older site where a sail loft used to be. Next door is the even quainter building, with its whitewashed walls, cedar roof and pretty blue shutters. 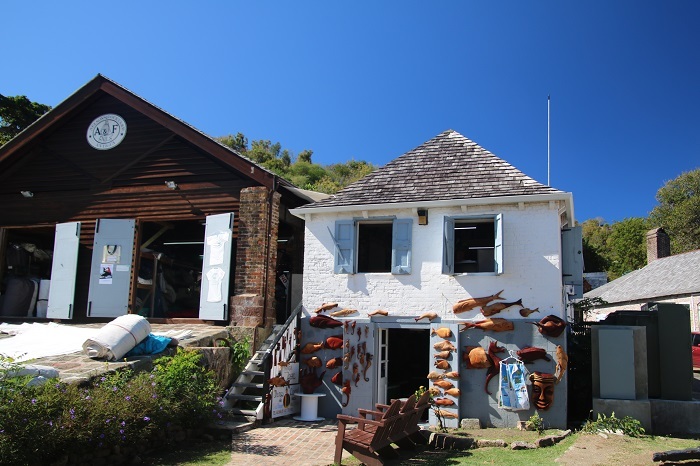 It is a shop full of carved wooden fish and turtles for sale and a good amount of pottery. The fish were very tempting, but we didn’t buy one. How to choose? 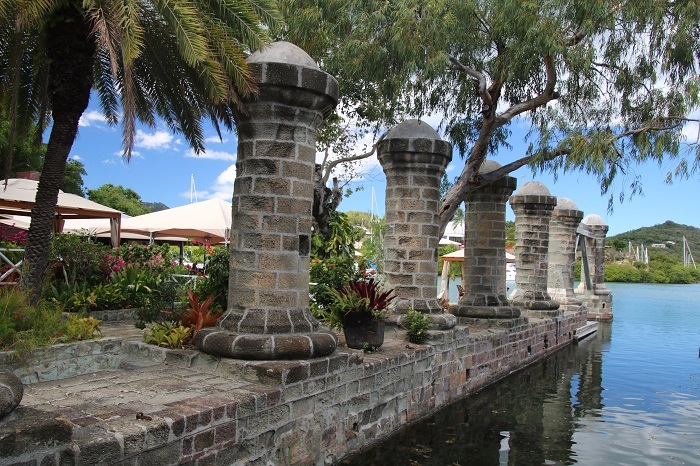 These columns used to support a building that housed another sail loft, in use during Nelson’s time. 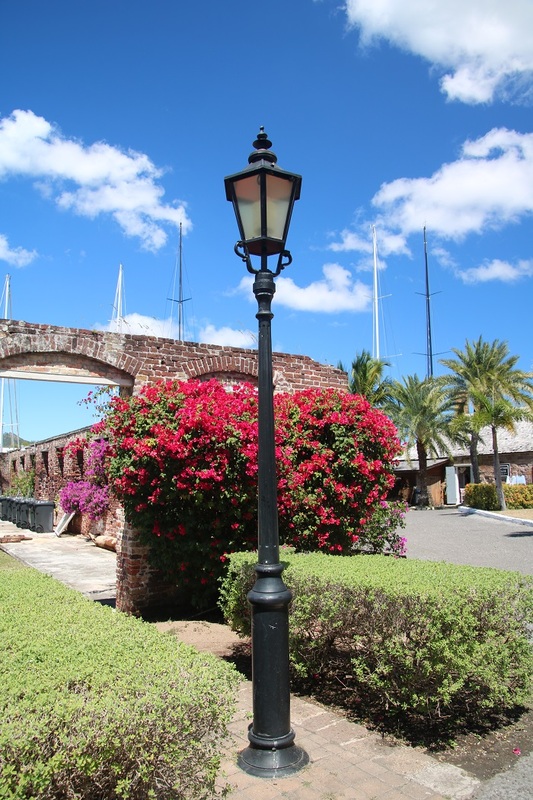 Now the columns have been restored to enhance a beautiful garden setting for a local resort and restaurant. I’m definitely giving this place a try in the next few days. I am confident the meal will be as memorable as the setting…. …starting with cocktails right here! I will have to have something thoroughly English, like a Pimm’s Cup or a G&T. Bring it on! 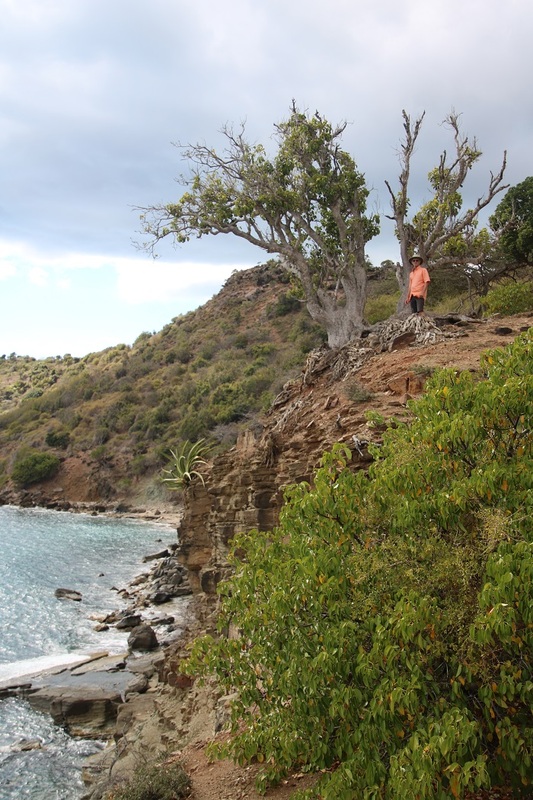 With our friends Maureen and Bill (from Kalunamoo), we walked out to one of the promontories on this end of the island. There are a couple of defunct cannon here from the distant past when this harbor needed protection. I wonder if this tree was sapling back then. 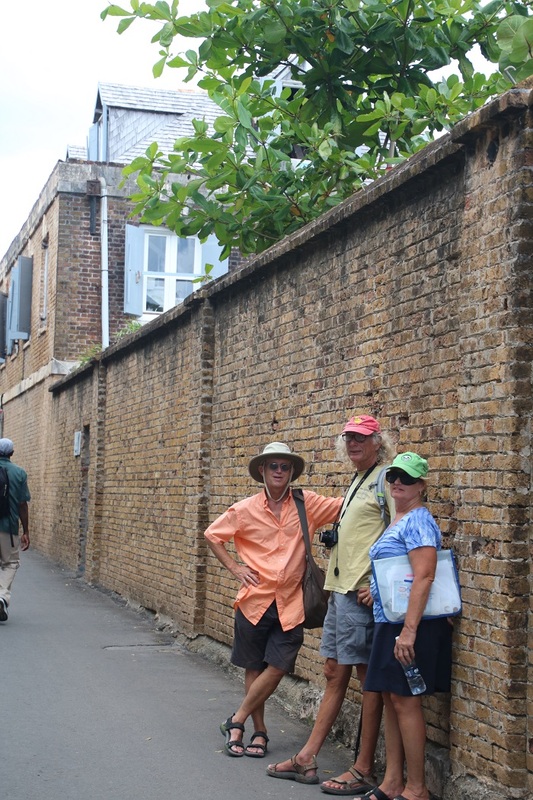 Walking back into the village I caught our friends and Bob stopping along a beautiful walled garden. Yesterday we moved to Nonsuch Bay, and today has been a day of household chores. Bob has been busy ‘whacking’ the SSB mole, with no success, and I did two loads of laundry. In this climate the first load dried, flapping in the breeze on our makeshift laundry line at the back of our cockpit, by the time the second load was finished. I do love having a washing machine onboard….one less thing to search for on shore. Now that the laundry is done I think I will spend a little time on embroidery while sitting on the shady side of the cockpit. Be safe. Love your adventures. Here in mid TN yesterday we were a balmy 80. Rose this morning to 50° .